Have you ever battled with depression? Depression often has a negative connotation associated with it and many people suffer in silence. 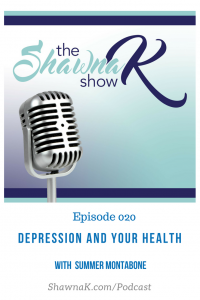 Today’s podcast will be especially helpful for those of you that deal with depression to find some hope and solutions. My guest, Summer Montabone is a very accomplished fitness icon, yet battled with (and still deals with) depression. Listen to her story of how she overcame a debilitating depression that put her in the hospital. She has some enlightening tips to help you deal with depression too. Summer Montabone has a passion for helping people live happier, healthier lives. It’s a passion that has expressed itself in many ways over her life and career — through her roles as a teacher, coach, professional athlete, entrepreneur and mom. You can find her on Facebook here and her website here. As the owner of Summer’s Fitness in North Canton, Ohio, Summer and her team of personal trainers offer fitness bootcamp and small group training programs designed to help clients meet their personal fitness goals. The facility, which opened in 2007, has enabled Summer to help hundreds of men and women not only lose weight and gain confidence, but transform their lives in the process. Fitness has played an important role in her life long before opening Summer’s Fitness. As a track and field athlete and gymnast at The University of Toledo, Summer graduated in 1998 with a bachelor’s degree in health and physical education. After teaching at Toledo Whitmer High School, she moved back home to Akron, Ohio to start her personal training business in 2002. She became a certified strength and conditioning specialist (CSCS) in 2003 through the National Strength and Conditioning Association, and is also certified in prenatal and HPL resistance band instruction. During this time, Summer also began competing as a professional fitness athlete. In 2004 she won both the “tall class” of the National Physique Committee (NPC) Fitness Championships and the overall NPC Ohio State Fitness and Figure Championship. As a professional athlete, Summer has appeared in national fitness magazines and DVDs as both a model and contributing expert. A serial entrepreneur, Summer’s personal training business didn’t stop with the opening of her fitness facility. She went on to create MySpeedCoach.com, a comprehensive speed and agility training program which offers custom programs for anyone from middle school students to professional athletes. Summer also founded Team VIP (Very Impressive Physique), which helps prepare physique athletes for competition. But in 2011, a battle with postpartum depression set Summer on a path to helping others with their mental health, as well. Committed to ensuring other women don’t suffer in silence from anxiety and depression, she turned her studies to personal development and coaching. Now, Summer’s mission includes raising awareness of mental health issues and helping others embrace their personal struggles by turning them into the power to overcome adversity. This renewed focus on holistic health and wellness has also led to a successful career improving the lives of others through Arbonne International’s natural skin care and nutrition products. Summer quickly rose to the rank of regional vice president with Arbonne and has received numerous honors from the company, including the Parade of Champions, Circle of Excellence, and Top Organizational Growth awards. Summer is also involved giving back to her local community. She is a founding member of Women’s Impact Inc., and a contributor to Girls on the Run and many other local charities. She currently lives in Jackson Township, with her husband Jeremie and their two daughters.